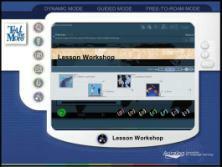 Multimedia solution for Spanish and Latin American Spanish language learning. Beginner, Intermediate, Advanced. TeLL me More, the world's leading software for language learning, is valued by users and teachers alike for its speech recognition technology and personalized language courses. TeLL me More now has more than 5 million satisfied users worldwide. The latest intelligent software version evaluates your progress as you learn, and uses your results to suggest the activities and exercises best suited to your needs. Whatever your objectives or level, TeLL me More adapts to your needs and guides you through the learning process, just as a teacher would. This package contains levels Beginner, Intermediate and Advanced, and is the perfect solution to learn Spanish with more than 750 hours of content. It also includes 250 hours of learning of Latin American Spanish, levels Complete Beginner and Beginner. It was just awarded the number 1 ranked product and "Top 10 Reviewers' Choice Gold Award Winner" for Spanish Learning Software. The Oral Workshop contains numerous dialogues and interactive videos focusing on both oral comprehension and expression. This Complete Course contains 4,000 exercises, organized in 35 different types of activities. 850 hours of learning! State-of-the-art speech recognition technology enables you to evaluate your pronunciation, and automatically detects and corrects your errors (using S.E.T.S. technology). 2 Hours of video activities included. You can install TeLL me More to receive the explanations (translations, grammar rules, etc.) in English, Spanish, French, German, Italian or Dutch. The packaging and user manual, however, are in English. Over 850 hours of learning. SETS: Spoken Error Tracking System. Free headset with microphone included.